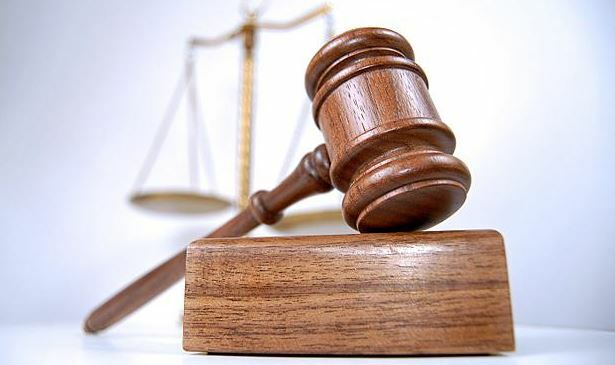 LAHORE: Pakistan has been ranked among the 10 worst countries in the Rule of Law Index 2017-18 issued by World Justice Project (WJP) as a result of its poor score in factors like governance, corruption, fundamental rights, security, regulatory enforcement, civil justice and criminal justice. Pakistan rose one position for overall rule of law performance (from 106 in the WJP’s Rule of Law Index 2016-17) to 105 out of 113 countries in the 2017-2018 edition. Its score places it at 5 out of 6 countries in the South Asia region, 26 out of 30 among lower-middle income countries, and 105 out of 113 countries and jurisdictions worldwide. 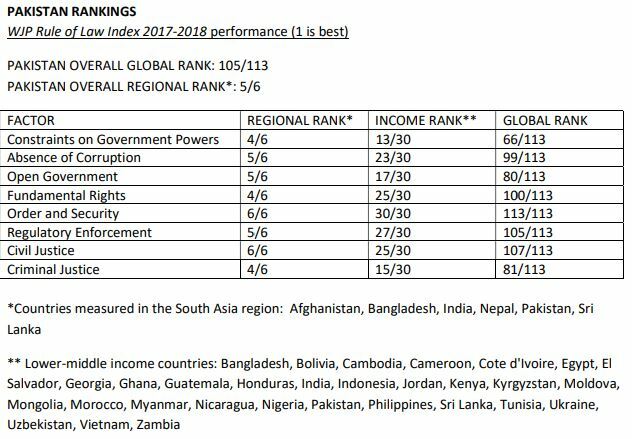 Regionally, South Asia’s top performer in the index is Nepal which rose 5 positions to 58th place out of 113 countries worldwide. With the exception of Afghanistan, which stayed in 111th place, all of the countries in this region improved in the global ranks. Sri Lanka improved the most dramatically, moving up 9 positions to 59th place out of 113 indexed countries. The top three overall performers in the WJP’s Rule of Law Index 2017-2018 were Denmark (1), Norway (2), and Finland (3); the bottom three were Afghanistan (111), Cambodia (112), and Venezuela (113). Globally, a majority of countries worldwide saw their scores decline since the publication of the last report in the areas of human rights, checks on government powers, and civil and criminal justice. The WJP’s Rule of Law Index is a source of original data on the rule of law. The index relies on more than 110,000 household and 3,000 expert surveys to measure how the rule of law is experienced and perceived in practical, everyday situations by the general public worldwide. The World Justice Project (WJP) is an independent, multidisciplinary organisation working to advance the rule of law worldwide. Effective rule of law reduces corruption, combats poverty and disease, and protects people from injustices large and small. It is the foundation for communities of equity, opportunity, and peace—underpinning development, accountable government, and respect for fundamental rights.